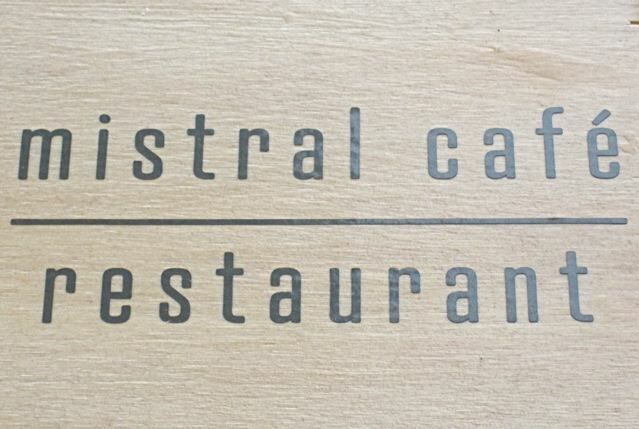 The menu on the wall outside Mistral Café Restaurant looks all too familiar. There's pork schnitzel, beef with cream sauce and dumplings, and steak tartare. But if you assume that this new restaurant by the Starometska metro station is the same old thing, you'd be wrong. 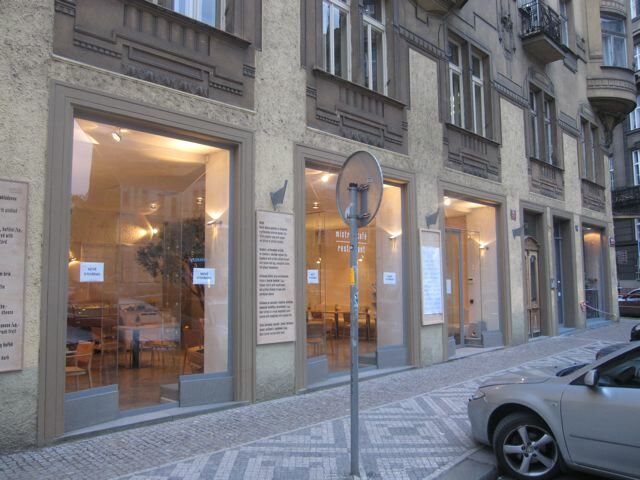 First of all, it doesn't look like other Czech eateries in this city. The scored concrete walls, smooth concrete floors, open space, and high-intensity spot lighting, give the restaurant the spare aesthetic of an art gallery. It's not that surprising since it took the place of the Arzenal Design Lounge, which sold the art glass of Bořek Šípek. 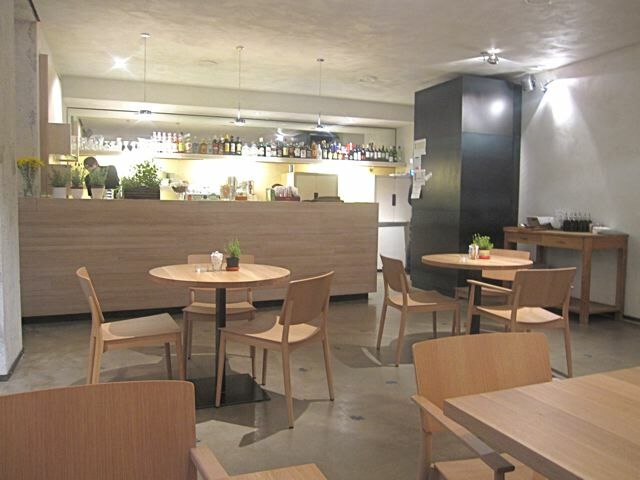 There's a separate dining area in the back near the bar and service area. 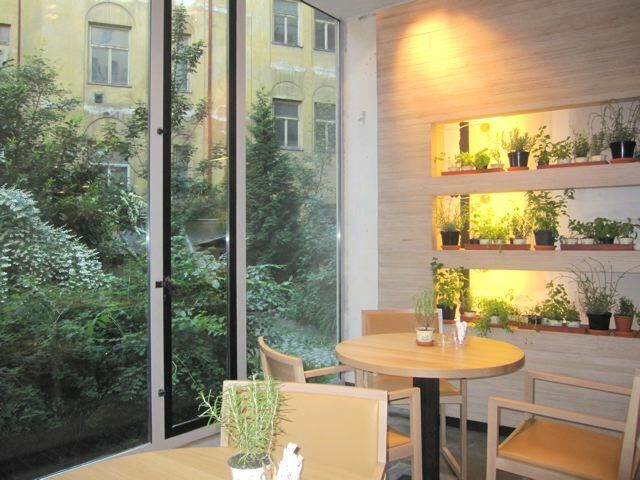 And there are three tables next to shelves of fresh herbs that look out over a nice garden. The back window opens wide, but it's not possible to sit outside. I decided to go to Mistral after a positive comment on the Czech Please Facebook page. But the non-Czech offerings I saw on the menu when I walked by also piqued my interest. 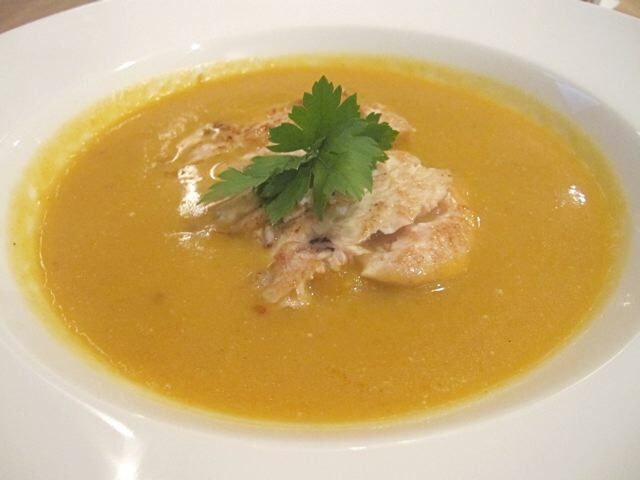 On my first visit, I ordered the thick pumpkin soup with ginger and grilled chicken (79 CZK). I'll confess to low expectations. I'd never had a good pumpkin soup in Prague outside of my own kitchen. But this one was excellent and almost exactly as I'd have made it. The soup was, indeed, made with real, pureed pumpkin, and it sparkled with fresh ginger. The sliced chicken breast was tender, and rested on a bed of sliced pumpkin. One of my few quibbles would be that the chunks only had a dull, earthy flavor. Also, the soup was fairly salty and, for my personal taste, a hint of sweetness and a shot of lemon would have improved it. 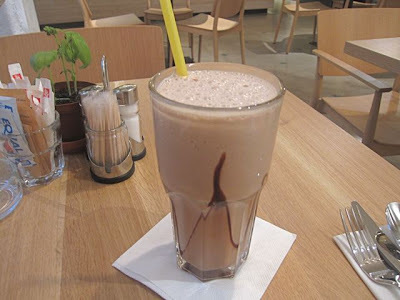 I passed on their alcoholic offerings and ordered a chocolate milkshake (42 CZK). It was a generous size for the price. But this shake suffered from low-quality, artificial-tasting chocolate ice cream. It was also on the milky side and had small ice chips in it. 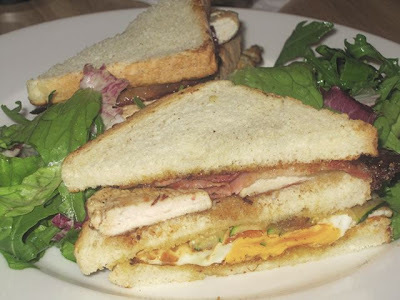 I ordered the bacon, egg, chicken breast and fried zucchini sandwich on toast with ginger mayo (95 CZK). This was a buttery, decadent sandwich, and I enjoyed every bite. Everything on the toast had that just-off-the-grill taste. The properly-cooked chicken was similar to that in the soup. I thought I'd mind having zucchini in this combination, but the thin slices, cooked to softness, really worked. I enjoyed it much more than the unwieldy bacon, egg, and chicken sandwich at Cafe Savoy. And it was also better than the simple Club Sandwich at Cafe Louvre. I did not see or taste the ginger mayo, so I mentioned it to the waiter. This led to an odd, and somewhat amusing experience. 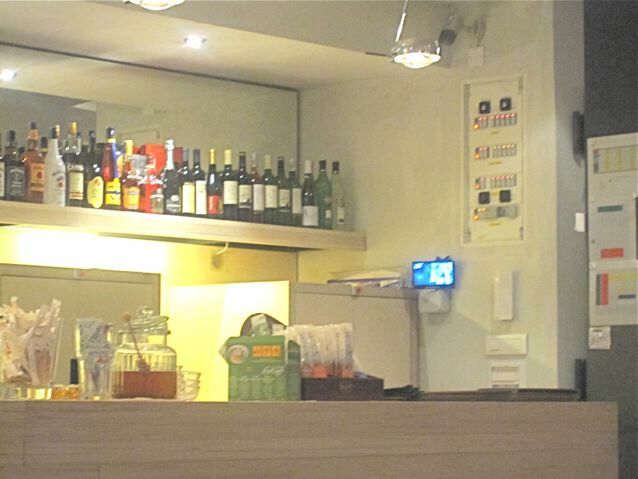 The waiter communicated my complaint to the chef, who works in the basement, speaking via two-way closed circuit video. The audio of the chef could be heard all the way to my table. "I put the mayo on the sandwich!" he said. Then, the waiter comes over to tell me the chef is sure he put the mayo there. It could well have been true -- the heat of the chicken, fried egg, and toast may have caused it to disappear into the buttery bread. Still, I didn't really taste it, so it would have been best if the chef had sent up an extra portion on the dumb waiter. Along with my sandwich, I also got their homemade French fries (41 CZK). 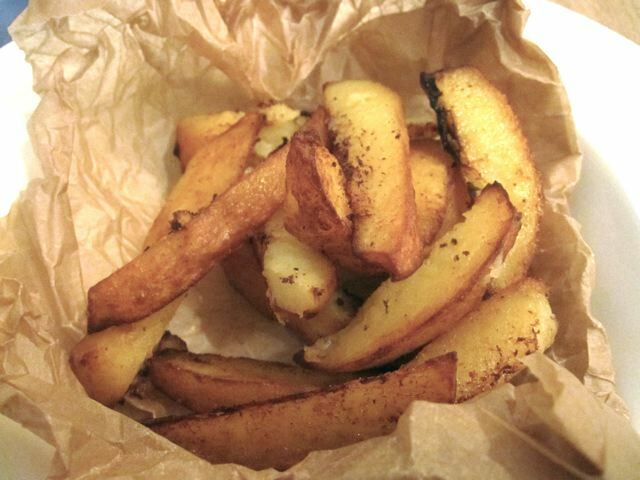 Some might find them too greasy, but I liked the large, lightly crispy wedges, served in brown paper. I had to ask for ketchup, which was duly sent up in a small dish from the basement without complaint. 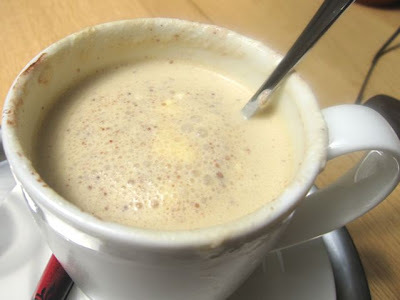 It was a cold, unpleasant spring evening, and I was in full comfort food mode. I was pleased with my meal. The chef might not be a great diplomat, but he had a flair for flavor. It made me curious about how they execute other items on their menu. I was back the next day. 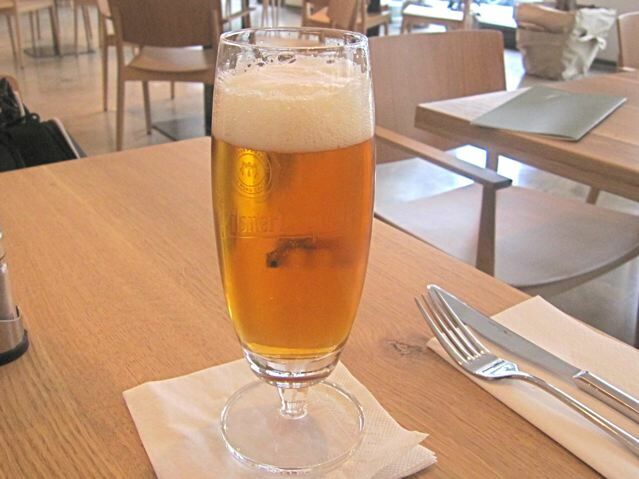 This time, I started with a Pilsner Urquell draft, which they only serve in .3 liter glasses (29 CZK). All good. Then, I ordered the grilled pork "sirloin" marinated in honey and chili with a mushroom ragout in cream sauce (189 CZK). I liked it. There was no sweetness from the honey marinade, but a very mild heat from the chili. 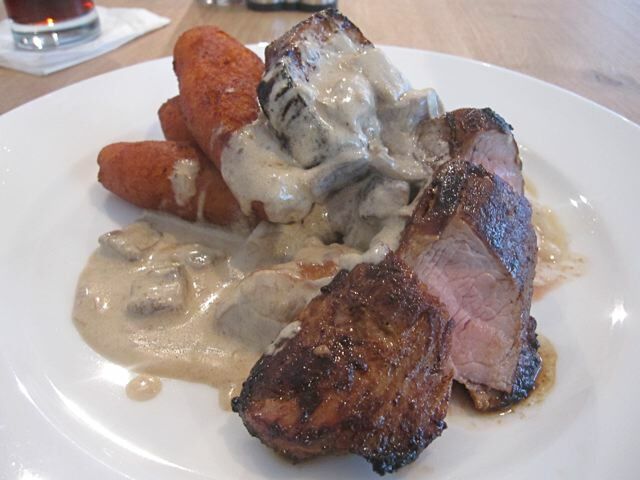 The meat itself, a generous portion of tenderloin, was tender, juicy, and cooked just right. They used good mushrooms in the sauce. On the side were what they called "potato lumps." That's a pretty good description, but if it were up to me, I'd call them fried mashed potato fingers. I found them addictively delicious, especially with the sauce. 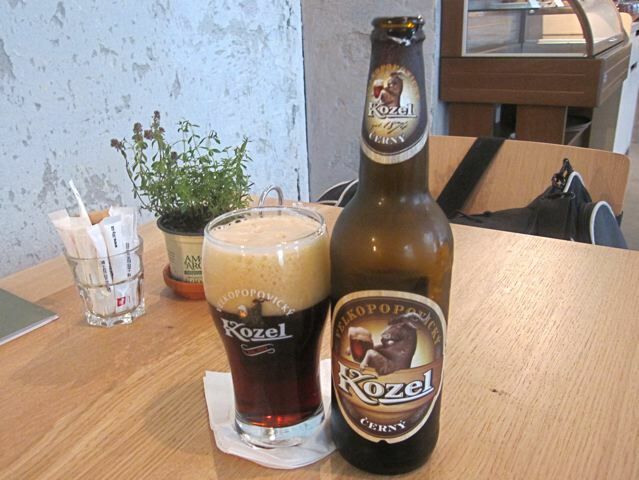 With this course, I had a .5 liter bottle of Kozel dark (37 CZK). The subtle coffee-chocolate flavors in this beer went extremely well with this dish. I felt obliged to try a dessert. I went for the pancakes with raspberry compote and Czech cream cheese or tvaroh (79 CZK). The little pancakes looked invitingly thick and fluffy. But I was disappointed. Though clearly homemade, they had been made earlier and reheated. They weren't hot enough and were too chewy. The cappuccino was fine. Although not perfect, something about Mistral intrigued me. I returned again the next day. Since the first soup was so good, I thought I'd have another. I got the tomato with cheese-curd ravioli (49 CZK). 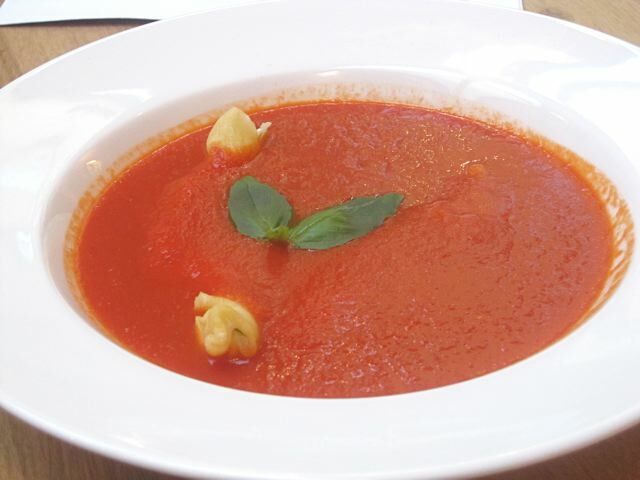 The soup of pureed tomatoes had a thickness to it. But it was on the bland side. 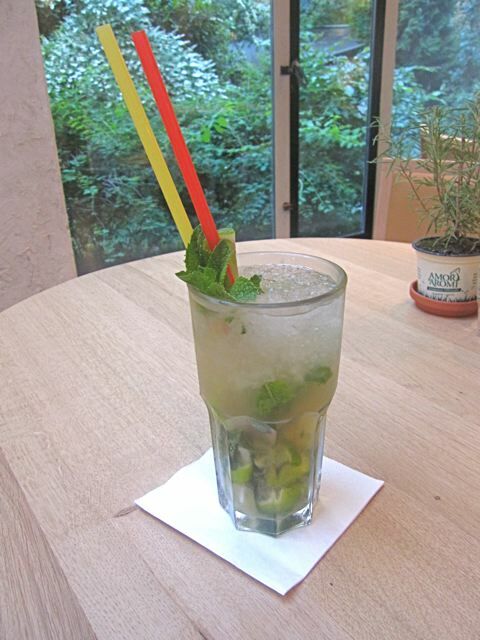 It came with basil leaves, but it would be much better with a stronger shot of basil flavor. The "ravioli" were long, finger-like things that were stale and chewy. Very unfortunate. They have some cocktails on the menu, so I tried a mojito (119 CZK). It was a good, well-mixed drink for a good price. I wanted to see how they did a Czech classic. 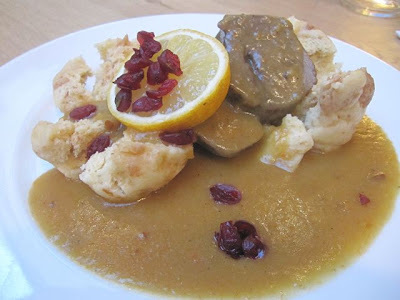 So I came back the next day for a third meal and ordered the beef with cream sauce and dumplings, also known as svíčková na smetaně (149 CZK). Although the literal translation is "tenderloin," most restaurants use a lesser cut. But here, they clearly used a better cut. It even had the thick, round shape of a tenderloin. Of course, it was cooked almost to a braised state like many places do. But it was still tender and tasty. But the sauce was the best part. Unlike some places with a thinner sauce like Lokál, Mistral's had a body to it from all the pureed vegetables. Its lemony tartness stood above its light sweetness. I liked that there was a squeezable piece of lemon included, unlike most places which give just a slice. And instead of the usual cranberry sauce, there were dried cranberries. The only bit that really failed were the dumplings. Those were really dried out and chewy. I was still curious about what the kitchen was capable of so I came back the next day for an unprecedented fourth consecutive fact-finding trip. 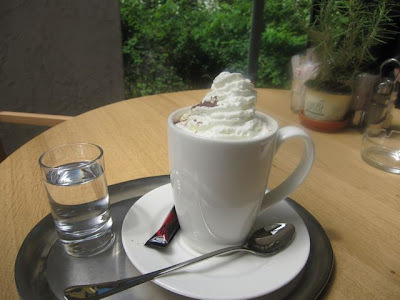 I started off this visit with their ice cream coffee (52 CZK). Served in a large coffee cup, it was not mixed well, and there was not enough ice cream. After stirring it up, it looked like this. I added some sugar to make it more milkshake-like. 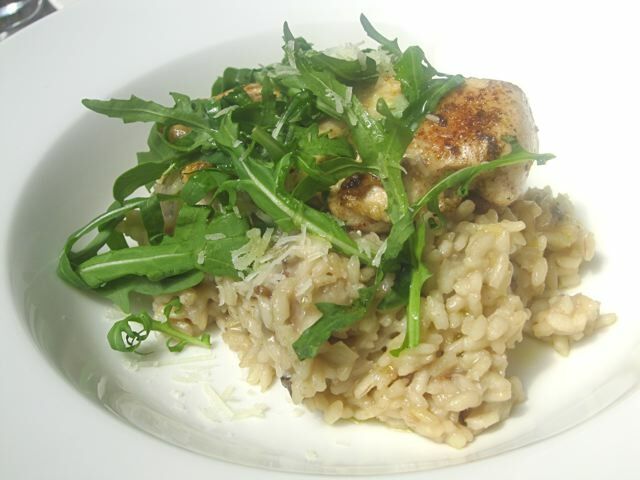 The mushroom risotto with chicken (145 CZK) was listed under small dishes, but it was not so small. This dish was probably the biggest failure of those I sampled. The rice was so al dente and even dry that I got mandibular muscle fatigue. There were some beautiful wild mushrooms that made a contribution to great flavor. But the whole thing was way too salty. And in this dish, the ubiquitous chicken I'd seen in other items was overcooked, tough, and dry. 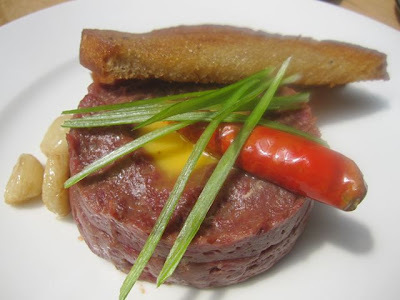 I also ordered steak tartare (249 CZK). 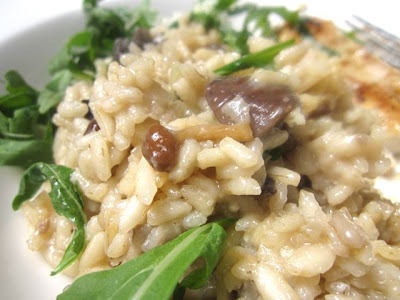 I had expected it to come as a second course, so I was unhappily surprised when the waiter brought it out with my risotto. The beef was lightly seasoned with salt and ground relatively smooth. Unlike many other versions around town, I couldn't detect any significant level of onion, garlic, ketchup, or mustard. Still, I enjoyed this simpler iteration. There was roasted garlic on the side, which was a little more awkward to eat than the usual raw stuff that can easily be rubbed on the fried bread. 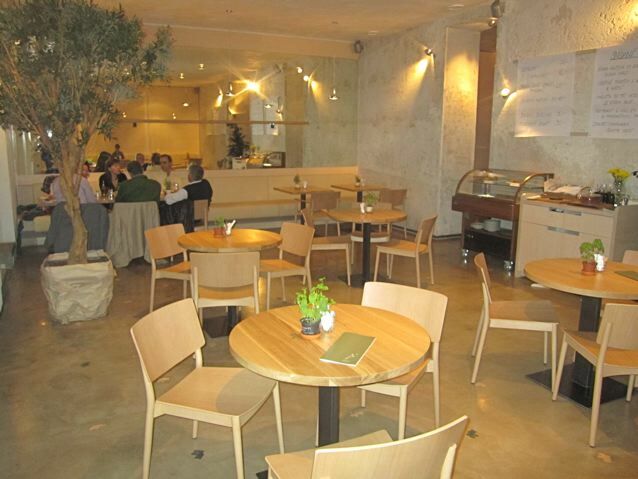 Mistral Cafe Restaurant can be frustrating. Some dishes are great. Some fall flat. Sometimes you'll love what's on the left side of the plate, but not the right. The kitchen took its eye off the ball when it came to consistency. Some of this, I'd hope, is because the restaurant is still very new and there aren't a lot of customers yet. On the plus side, the prices are quite reasonable for the center of Prague. Some of the city's great sights are just a few steps away. They also do breakfast, which I have yet to try. But I'd be more than happy with one of those egg sandwiches. Even with some miscues, they've managed to take plenty of familiar things and make them seem new for me. And that's no small thing. 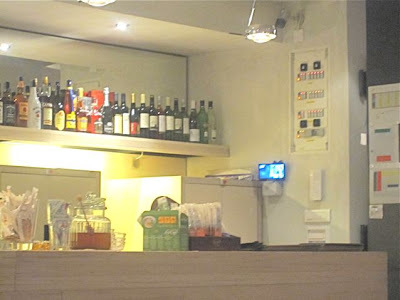 This is going to sound hideously ignorant, but how do you find the spoken English in Prague restaurants? I'm travelling next month and am beginning to feel a little apprehensive of looking foolish for having little grasp of the Czech language. Despite my best efforts the trip is very much a last minute booking so I haven't had much time to learn. I speak near fluent German as well though I gather English is more popular? Would you also recommend any particular restaurants of interest for a new-to-town couple to visit? You'll be just fine with English. Try Cafe Savoy a good breakfast (lunch or dinner). 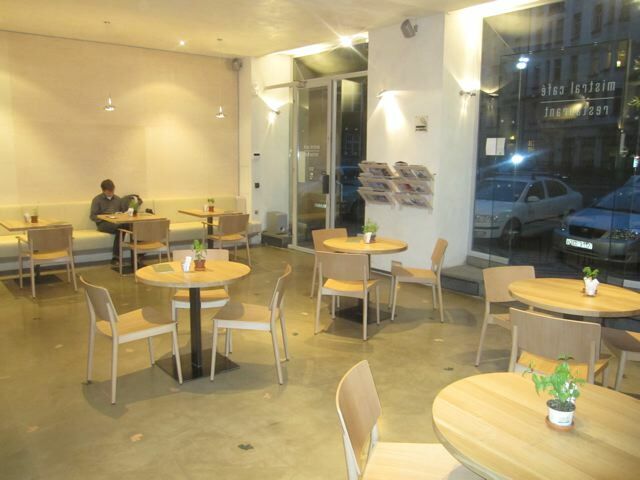 The food at Cafe Louvre isn't as good, but Kafka and Einstein used to hang there. Otherwise just browse the blog to see if something catches your fancy. Sandlefish, I agree with Brewsta here. There are very very few young Czechs who don't speak any English at all. You'll find that if you're not a jerk about it, they actually speak pretty darned good English (almost all the menus you'll see downtown will be in at least Czechlish if not the Queen's English so you can point and choose, if nothing else). "Pivo", "gulas[h]" and "svic[h]kova" are the three most important, I've found for my tastes, though the "kachna" (duck) is also nice! Don't be a rude pushy foreigner and don't expect the awful American "Hi, my name is Becky!" stuff and you'll do fine. 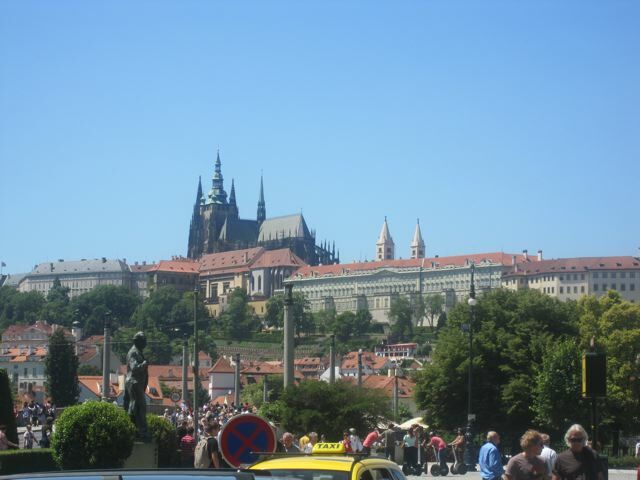 Czechs are much more reserved and honest than most foreigners have experienced, so that's part of the trip! I would just say, don't tip extravagantly (it ruins it for the rest of us!) unless you have had exceptional service. 5-10%is just fine, if not excessive in most places. Finally, I met with a friend of mine recently who has tolerated my fluentish-but-still-bad Czech for ages. He suddenly broke out into very good English (I hadn't even realised he spoke it). He was just shy about making mistakes and afraid to look silly in front of me. Many thanks Brewsta and Anonymous for the advice. I almost feel embarrassed asking anyone if they speak English incase I look like the arrogant or rude British tourist who expects people to speak his language.. Wherever I have travelled previously I have always made an attempt to speak the language as much as possible and have spent at least a few months learning (except for any trip to Germany where I'm comfortable with the language). I'm going to be spending the next month hammering the Czech books I think (I personally feel you learn more about a place culturally if you at least attempt the local language) but with a month to go I was a little apprehensive. Many thanks again for the advice! Glad to hear you're concerned about knowing something about the country you're visiting! English is fine in Prague, but do know the key words in Czech (you can look up plenty of menus of local restarants on the internet and get both Czech and English translations so that will help immensely). Back in the late 80s and early 90s, German was the second language on the street (most people here refused point blank to speak the Russian they spoke fluently) as the East Germans up until then had made up the bulk of tourists. Learning English properly wasn't even an option in those days (and what on earth would you have used it for anyway given the lack of opportunity for travel?). By about the mid 90s as all the Americans arrived AND all the young Czechs wanted desperately to travel outside the former Eastern Bloc, things changed massively in Prague. The Americans have now mostly gone, replaced by the Brits and Irish on weekend holiday. 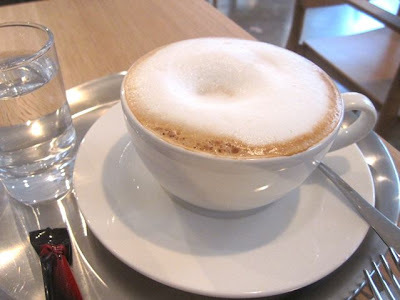 If you're speaking to an older Czech, many speak fluent (if rusty) German. If you're speaking to a younger Czech, I don't know that many who speak German at all, unless you're talking about a bordertown or, say, Karlovy Vary where plenty of German tourists still go. Most speak very good English (and, sadly for them, very few of them agree to recognise even a single word of Russian). So stick with the English & Czech you can manage, but you might also try German because someone who speaks German in Prague probably has a special reason for doing so (boyfriend, relatives, etc.) and might appreciate the opportunity. Hi - I'm not sure how else to contact you so I hope you get this. I would like to post a link to your blog on mine, if that's ok with you. My blog is http://praguemylove.blogspot.com/ (was just on holiday so I haven't posted in 2 weeks, but will be making up for that this week!). Love your blog by the way...makes me hungry!